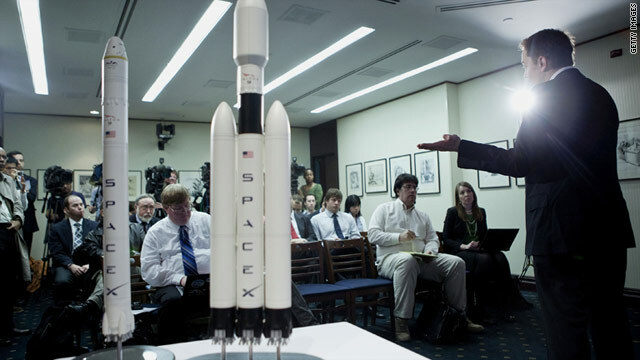 Elon Musk, founder and CEO of Space X, announces a new cargo rocket in Washington on Tuesday. (CNN) -- A commercial rocket company has announced plans to go where no other has gone before. Elon Musk, founder and CEO of Space X, said Tuesday that his company is building a rocket big enough to carry more cargo than any space vehicle ever built except the Saturn V moon rocket. Musk made the announcement during a news conference at the National Press Club in Washington. The rocket -- called Falcon Heavy -- will arrive at the Vandenberg Air Force Base launch pad in California in November or December of next year and should be ready for its first test flight in late 2013, Musk said. Space X is in talks, he said, with several countries, including the United States, and private companies interested in using Falcon Heavy. Space X is paying for all the development costs leading up to and including the first test launch. Musk told CNN it will cost somewhere between $300 million and $500 million. No paying customers have come forward so far for the first test launch, Musk said. "We have lots of customers for the second, third and fourth launch," he said, "but they didn't have the risk appetite for the first flight." Space X says the first launches will take place at Vandenberg but eventually Kennedy Space Center in Florida also will be used. Musk said his company is talking with NASA about using one of the two space shuttle launch pads for his new rocket. He said production of Falcon Heavy should create a couple hundred jobs in Florida and California. Overall, Musk said, he expects a couple thousand jobs to be added during the next two years in Florida, California and Texas. Musk told CNN he decided to build the heavy lift rocket because he needed it to put bigger satellites into orbit than his smaller Falcon 9 rocket can handle. Musk said he believes his new rocket will be capable of putting large payloads into orbit for $1,000 dollars per pound. The lowest current cost is roughly $6,000 per pound. Musk told CNN he wants to bring "revolutionary change, not evolutionary change, to the space business." This rocket, he says, is revolutionary. "The public should be very excited about this. It re-establishes U.S. leadership in space," he said. Falcon Heavy also will be able to carry humans to the moon or perhaps Mars, Musk said. Because Falcon Heavy won't be as big as the old Saturn V, more than one rocket would be needed to carry out those missions. For a mission to the moon, for instance, one rocket would carry the lander and another would be for the crew and command module. Space X already has a contract for a dozen cargo flights to the International Space Station using the smaller Falcon 9. That rocket has already flown two successful test flights and, barring setbacks, should begin the cargo flights next year. Space X is also in the running to replace the space shuttle program for ferrying astronauts to the space station.